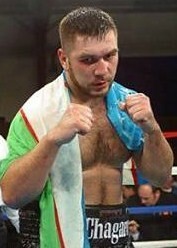 Former WBA heavyweight champion Ruslan Chagaev (32-2-1, WBA # 3) takes on Frez Oquendo (37-7, WBA # 6) ) June 7 in Grozny (Russia). There will be a press conference at the Hotel Grand Elysee in Hamburg on Tuesday (May 20) but neither Chagaev nor Oquendo will appear in person. Chagaev is along with trainer Artur Grigorian in training camp in Grozny while Oquendo prepares for the fight in Chicago so both will appear over video while promoter Timur Dugazaev is on hand in person. Both men hold two WBA subtitles and given the politics involved don´t be surprised if the winner of this fight will figure in a WBA world title fight in the near future. 42-year old Jean Marc Mormeck (36-5) will return to action and have a fight lined up June 26 in d´Asnieres (France). Mormeck was last seen in 2012 fighting Wladimir Klitschko and was blown away in four after a poor performance but for his comeback Jean Marc will drop down to cruiser where he held both the WBA and WBC titles. He retired after losing to David Haye in 2007 but returned as a heavyweight in 2009 where he won four straight before getting a shot at Klitschko. As for comeback opponent the French Federation have turned down Georgian Shalva Jomardashvili based on his poor recent record with six losses in his last ten fights, five inside the distance. EU bantam champ Anthony Settoul (19-2) defends the title June 7 in Villeurbanne (France) against Omar Lamiri (11-1) in an all French matchup. Settoul won the title late last year and this his first defence. Lamiri is reigning French champ and have home town advantage in this one. WBO Youth supermiddle champ Tyron Zeuge (13-0) defends the title against Armand Cullhaj (15-4-3) June 7 in Schwerin (Germany) on the undercard to Braehmer vs Bolonti.